Grade 1 winner Knicks Go heads a field of 10 3-year-olds entered in Saturday's 39th edition of the G3, $250,000 Sam F. Davis Stakes, the centerpiece of Festival Preview Day 39 Presented by Lambholm South at Tampa Bay Downs in Oldsmar, Fla. The Sam F. Davis, contested at a distance of 1 1/16 miles on the main track, is the 11th race on a 12-race card scheduled to begin at 12:12 p.m. The race is a “Road to the Kentucky Derby” points race, awarding 10-4-2-1 points to the first four finishers toward qualifying for a berth in the Run for the Roses on May 4 at Churchill Downs. Three other stakes are scheduled Saturday, with two on the turf: the 33rd running of the G3, $175,000 Tampa Bay Stakes for horses 4-years-old-and-upward, scheduled as the eighth race, and the 20th edition of the G3, $175,000 Lambholm South Endeavour, for fillies and mares 4-years-old-and-upward, which is the 10th race. Both turf events are at 1 1/16 miles. The fourth stakes on the Festival Preview Day 39 card is the 39th running of the $150,000 Suncoast Stakes for 3-year-old fillies at a mile-and-40-yards on the main track. The Suncoast is the ninth race. By virtue of his victory in the G1 Claiborne Breeders' Futurity on Oct. 6 at Keeneland, Knicks Go will carry top weight of 124 pounds in the Sam F. Davis. Owned by KRA Stud Farm and trained by Ben Colebrook, the son of Paynter will be ridden by Albin Jimenez and break from the No. 3 post position. The Maryland-bred Knicks Go finished second in the G1 Sentient Jet Breeders' Cup Juvenile on Nov. 2 at Churchill Downs. 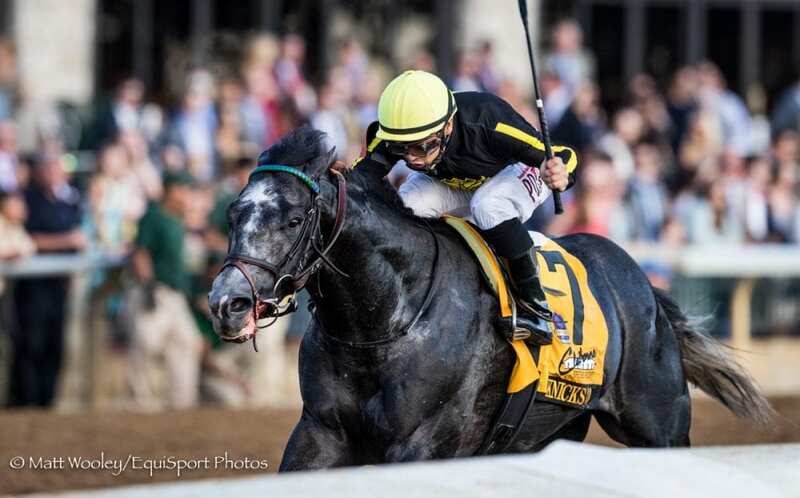 His 2018 ended with an 11th-place finish at the favorite in the G2 Kentucky Jockey Club Stakes Nov. 24 at Churchill. Two other stakes winners are entered in the Sam F. Davis. Five Star General, a Distorted Humor colt owned by WinStar Farm, China Horse Club International and SF Racing and trained by Arnaud Delacour, won the Central Park Stakes on Nov. 22 at Aqueduct. He will be ridden by Jose Ortiz and break from the No. 7 post while carrying 118 pounds. The other stakes winner in the field is Well Defined, a Florida-bred gelding by With Distinction who won the Florida Thoroughbred Breeders' and Owners' Association Florida Sire In Reality Stakes on Sept. 29 at Gulfstream. He will break from the No. 9 post under Pablo Morales and carry 122 pounds. Well Defined is bred and owned by Stonehedge and trained by Kathleen O'Connell. The other Sam F. Davis entrants, in post position order, followed by trainer, jockey and weight: 1.Counter Offer, Ian Wilkes, Antonio Gallardo, 118; 2. Going for Gold, Robert B. Hess, Jr., Jose A. Bracho, 118; 4. Cave Run, Eoin Harty, Jesus Castanon, 118; 5. Moonster, Dale Romans, Samy Camacho, 118; 6. Kentucky Wildcat, Tom Albertrani, Joe Bravo, 118; 8. So Alive, Todd Pletcher, Javier Castellano, 118; 10. Still Dreaming, H. Graham Motion, Jorge A. Vargas, Jr., 118. This entry was posted in NL List, Triple Crown and tagged Ben Colebrook, festival preview day, Five Star General, knicks go, Sam F. Davis Stakes, tampa bay downs, well defined by Press Release. Bookmark the permalink.